The urban legend that Coca Cola was originally green when it was first created is actually false (according to the company itself), but the idea still lives on in the hearts and minds of many of us. 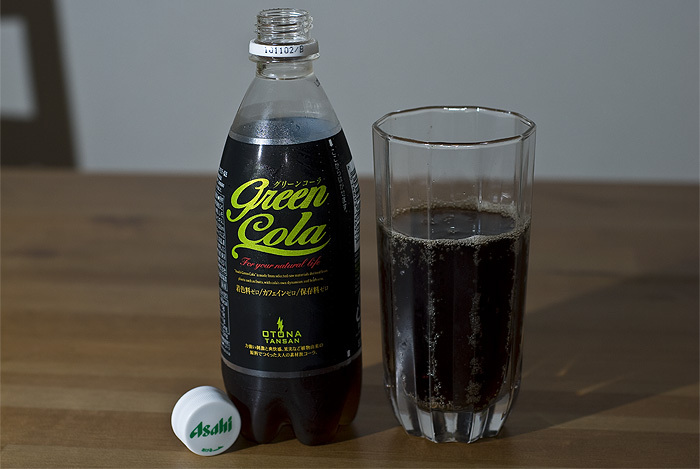 So it was with no little excitement that I first beheld Asahi's 'Green Cola' sitting on the convenience store shelves. It didn't take me long to figure out what was wrong though, it's not actually green. Sigh. Turns out that the 'green' isn't referring to the colour, but to the supposedly ecological way it's made. However there doesn't seem to be anything particularily environmentally friendly about it, unless the assertion that the drink's lack of colourants, caffeine and preservatives is supposed to equal green? Maybe Asahi is hoping people would focus on the gimmick instead of asking questions. So in all their boasting of being green, did they remember to think about taste? I suppose the short and easy answer would be 'no'. It's not that it tastes bad per se, but there is something about it that's a bit off. Maybe it's the fact that they used malt extract instead of caramel colour to give it a regular cokey brown colour. They would've scored more points in my book had they left colour out completely. What colour would coke be without caramel colouring? Clear? That would be cool. It is also fizzier than regular Coke, (which does a great job of covering up taste discrepancies), as well as being slightly weak tasting, like it has been watered down. My overall feeling? It's doubtful that purists (like me) will be replacing their Coca Colas with Asahi's gimmick brand anytime soon, 'green' or otherwise.